Why should there not be ‘stuff’, or ‘real things’ instead of weird quantum mechanics at some microscopic scale? In other words, how can we accept that direct realism is wrong without getting too ‘difficult’. Accepting that the world is in some sense in our minds is not aimed at encouraging ‘spirituality’ or whatever the euphemism for religious craziness is nowadays. I have none of that! Not even any switching on of consciousness once we add a little quantum magic to a zombie’s brain. There is indeed a deep connection* between consciousness and quantum physics, but for this article here, let’s forget about that connection. Nevertheless, the kind of scientism often advocated by science blogs, the feeling that facts are just out there in a really existing world, is strictly wrong. Philosophy knew it all along and physics has proven direct realism wrong, too. I am referring here to the Einstein Podolsky Rosen paradox and related experiments of course, the violation of the Bell inequality, and suchlike. However, how can a lay person best grasp that direct realism is wrong? That is difficult. 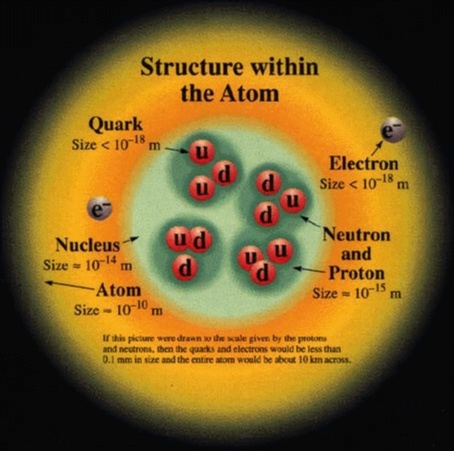 Some merely claim that we need quantum mechanics so that the electron does not fall into the atom’s nucleus. Any classical electric charge would spiral into the atom's nucleus. The material that they make up would collapse. The wording often involves a kitchen table or chair, which is maybe some chauvinistic association between arguments for dummies and housewives: Without quantum mechanics, the kitchen table would collapse into itself. Well, how convincing is this argument? Does it convince you? It would not convince me without a severe dose of already knowing at least a bunch of electromagnetism. Why could there not be some other, more intuitive explanation of why atoms do not collapse? Could not some hard sphere model maybe keep the electrons from falling in plus some clever shielding that stops them from radiating a changing electromagnetic field while moving around the nucleus? The underlying question is, why could there not be ‘stuff’, or ‘real things’, made out of yet smaller stuff, instead of there being weird quantum mechanics at some microscopic scale? Why should we think that at some small scale, there are all of a sudden not objects bumping around in a world but instead consistency of histories to conscious observers or whatever pipe dream? After all, if the smallest layer is woven from dreams, all the larger things build out of it are just as ghostly figments of our imagination, and who would want to admit that while ranting against the religious? The moon circles the earth, but they cannot circle each other forever. Even if they were not to lose energy via gravitational waves and even if the sun were not to expand and eat them at some point in the future, they still would stop rotating around their axes and around each other. They would stop even in a classical world with Newtonian gravity. Why can’t they go on forever? Because they are made up of smaller things! The small constituents will always be wiggled around relative to each other due to the movement and the forces that distort the larger bodies that they make up. The earth’s rotation and the rotation of the moon around the earth for example lead to ebbs and floods (the tides), and so the rotational energy decreases. The moon always shows us the same face – its rotation relative to us has stopped already. Pluto and its moon Charon always show each other the same side. We can describe this slowing of motion in many ways, but the gist is: they lose movement because they are made up of smaller things. The smaller things have many more ways to move, many more degrees of freedom, and so the energy in the end will be sucked up by those smaller things, like the waves and their motion due to the tides, the temperature of the water and the rocks and so on. You can also just use forces to infer the same result – it does not hinge on any abstract consistency like the conservation of often mysterious seeming energy. I believe it is quite acceptable to anybody who feels much more comfortable with cozy classical stuff and real forces, anybody with a healthy suspicion of ‘tricky’, ‘philosophical’ sophistry: Things made out of smaller things will lose their orderly movement to the many internal movements possible inside themselves, because there are so many little things inside. After all, this is an everyday observation. You may now scream “Second law of Thermodynamics”, but I do not want to throw laws around, because this would just lead people to counter with objections like “What if energy is not conserved?” The whole motivation of the belief in intuitive ‘stuff’ instead of quantum physics is to reject mathematical trickery and preferring a good old mechanical picture that can be understood and thus trusted. Same for billiard balls on a pool table: They do not go on rolling and colliding for ever. Why? Because balls and table are out of smaller things, ‘real things’ that behave in classical, intuitive ways. The balls collide and heat up, which is nothing else but increasing the motion of the thingies inside: molecules for example. And here is the main point: If atoms also consisted of ‘real things’, of ‘stuff’ that behaves like stuff usually behaves, like billiard balls, and if the electrons were like moons around planets and all that, you should expect them to over time slow down while the smaller stuff inside of them heats up. Real stuff out of smaller real stuff slows down and collapses into a motionless heap over time. However, atoms and the electrons inside the atoms do not do that! Gas molecules never slow down if you do not give them ways to get rid of energy to somewhere outside of the gas cloud. They never lose energy into their internal bellies, because there are no things inside of them that could take that energy. They just bump and bump and bump into each other forever, and that implies that what they consist of is something that behaves very differently from how things behave in our ‘real world’. Many people entertain thoughts about whether there is another little universe in every electron or whether the world could be infinitely nested, smaller things nested in smaller things like Matryoshka dolls. No, at least not in any useful sense of the word exist, because the smaller things inside have to be completely decoupled from all interaction with the outside. If they are not completely decoupled, they would sense the outside influence and by that fact alone would slow the outside down. Objections about that the little components might as well give the energy cleverly back in an orderly way are against the motivation behind ‘real stuff’ in the first place. If you need little fairies inside the atoms to make your ‘stuff’ work, it is precisely not normal ‘stuff’ anymore. The only way that there are smaller things inside smaller things inside smaller things is the quantum way: At some point there are entities that we may occasionally conveniently describe as if they are usual things (electrons, quarks, gluons, maybe strings) but that aren’t “things” as much as mathematical constructs, descriptions of properties that together are consistent within a stable world. They are not ‘stuff’ or even just a substance at all. Now let me criticize this right away so you do not have to. Of course this is not a proof of anything. That stuff out of smaller stuff would slow down and leave nothing but a dead heap reminds of entropy death. Surely we should not commit to a fallacy similar to the argument against Darwinian evolution that draws on a death that only needs to occur after gazillion eons. There is in principle nothing wrong with assuming a classical stuff-world where the coupling between two particular size scales, say the electrons and the strings that they are woven from, is so tiny that it all slows down on a time scale much longer than as yet physically observable durations. Sure, there is no lay-level reasoning that can substitute for looking at real atoms and their electric charge distributions and at some point realizing that no real-stuff model could ever describe it, let alone still be more intuitive than the quantum description. And lack of intuitiveness is one of the main charges leveled against quantum mechanics. So let me stress again, this post may help some to embrace quantum mechanics and its destruction of realism as somewhat more ‘intuitive’, or less unexpected than one may have thought before, but it isn’t a proof – just some science outreach. *all phenomenal consciousness requires fundamentally a quantum description, but this is not important for this article. This is a little further explored in the no deeper consciousness and simulation hypothesis articles, without presenting the difficult core argument however.